Find Art Nouveau tiles in our online art tile catalog. See the many tile designs and patterns for Art Nouveau style in our SQUARE TILE COLLECTION and our FLORAL BORDER TILES. There are many other ideas and photos throughout our catalog. Many of Arts & Crafts and Art Deco patterns work with Art Nouveau style when appropriate glaze colors are used. The ornamental style of Art Nouveau is enormously popular among contemporary art lovers. This might not seem a big deal were it not for the fact that the style was first seen more than a century ago. Defined by sinuous lines and graceful curves, Art Nouveau takes its cues from nature and gives otherwise ordinary subjects (such as insects and blades of grass) a sense of dignity and illustrious beauty. 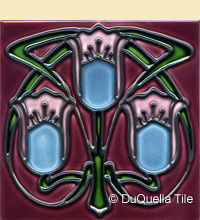 At DuQuella Tile, we are huge advocates of Art Nouveau. Subsequently, we are proud to offer an extensive collection of tile inspired by this magnificent style. In addition to our original pieces that we hand craft and design, we also create a vast selection of historical reproductions. These unique pieces recall the beauty of traditional Art Nouveau architecture and interior decor, but cost a fraction of the price of original pieces. Start your exploration of our Art Nouveau tile! One of the things we like best about Art Nouveau is the fact that it is memorable yet subtle. Our Art Nouveau tiles can instantly update a room in your house without overpowering it. Whether you want to completely redecorate or add accents to your bathroom or kitchen or wish to add some flavor to your fireplace surround, our Art Nouveau tiles are an excellent choice. Artistic expression and ceramic tiles are two things that are not often linked together. 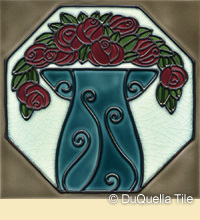 At DuQuella Tile, however, we are artists who specialize in traditional techniques and styles. Our decorative ceramic tiles are hand crafted, and we offer customized colors at no extra charge. Our Art Nouveau tiles don't just look like traditional tiles--we also use traditional techniques to craft each one by hand. Plus, we offer customized glazing at no cost to you. For more information about Art Nouveau tile and to see more images of our tiles, please continue to browse our site.